I'm building a mobile robotics project for a class and I'm trying to figure out how to (or even if its necessary) to design a nice battery power system for it. I sort of wanted to learn how to build a nice power system so that I have the knowledge and to experiment a bit, but i'm sort of losing my mind on a part of the project which isn't super necessary. I basically wanted to try to build a few nice features. 5) Be able to provide enough power at 5V for (At least) 2 small steppers, 1 small DC motor, and 2 small servos. One of the steppers might be close to providing stall torque. Basically, i've knocked up a few circuits that might work using several purpose built battery management IC's, but these small multi-purpose ic's are only really able to provide 1.5 - 2 A, which I really don't think is enough. Below is my latest idea. My friend is placing bets on which part of this circuit is going to catch fire. I'm getting pretty close to just trying to buy some ebay BMS chinese special and an ebay 5V boost converter and forgetting this whole thing because it's been a pain in the keister to get to this point. I've seen some power muxing solutions on here like this one but they're a bit complicated. 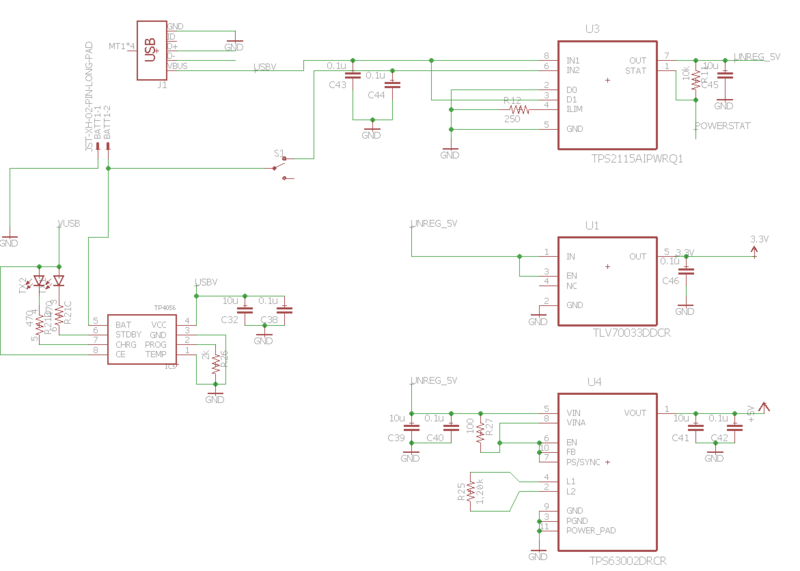 I could also use a 5V boost manager and sort of build my own boost converter instead of buying an all in one IC to get some more current but i've never done that before and it looks difficult. How are medium power battery systems like this usually designed? Is this all more trouble than it's worth? Thanks for reading, I hope this question is slightly interesting. Also as a completely unrelated question, how do you put out a lithium battery fire? Browse other questions tagged power batteries robotics lithium mux or ask your own question. Proper way of designing a battery backup system with 12V/5V dual output AC power supply? What property of USB battery packs allows them to simultaneously output power while receiving power?